In a story from the weird news section this past week, Tajik parents living in Russia named their newborn son Shoigu — after the Russian defense minister Sergei Shoigu. Shoigu’s cousin, who is being brought up by the same couple, used to be called Rasul. But earlier this month he was renamed Putin, in honor of the Russian president. The mother told reporters the names are a tribute to her idols. Perhaps it was an omen. Several developments suggest that the often-troubled relationship between Russia and Tajikistan is on the upswing. In particular, there is lots of speculation that Dushanbe may finally agree to become a member of the stumbling Moscow-led Eurasian Union trade bloc. Vladimir Putin’s spokesman, Dmitry Peskov, recently announced that the Russian leader will soon embark on a tour of Central Asia, taking in Tajikistan and neighboring Kyrgyzstan. The exact dates of the trip remain subject to discussions. Russian Deputy Prime Minister Igor Shuvalov laid the groundwork for the tour during a visit to Tajikistan on January 27. Shuvalov was ostensibly in Dushanbe to participate in the 14th session of the Tajikistan-Russia intergovernmental economic cooperation commission. Items on the agenda included — as stated in dry press announcements — cooperation in trade, investment, energy, education, science and migration. In reality, the session’s main task was to resolve an aviation dispute that has been dragging on since late last year. Disagreement over how many of either country’s airlines were authorized fly to the other has been causing headaches for travelers — mainly Tajik migrant laborers — as even Tajik President Emomali Rahmon conceded. 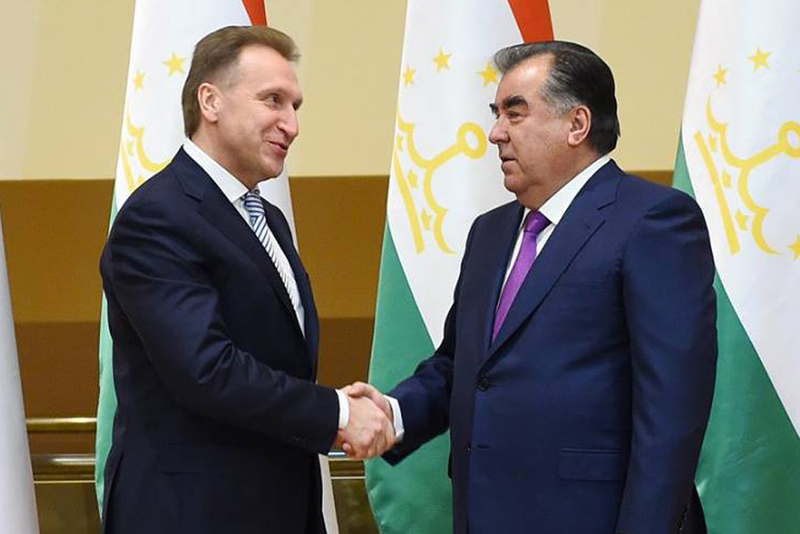 “It is creating difficulties for citizens and throwing a shadow over the condition of the strategic partnership between our two states,” Rahmon said at his meeting with Shuvalov. The talks did the trick. Tajikistan’s Somoni Air will again be able to fly to four Russian cities — Krasnoyarsk, Krasnodar, Orenburg and Ufa — closed to it for the past several weeks. For its part, Dushanbe relented by finally giving clearance to flights arriving from Zhukovsky airport in the Moscow region. While in Dushanbe, Shuvalov attended the opening of a representative office of the Russian Export Center (RETs) — a government-backed company that facilitates the operations of Russian exporters abroad. RETs representatives describe Tajikistan as a "key" destination for Russian goods and services in the former Soviet space. “In our portfolio, we have 20 Russian-Tajik projects worth $33 million, and an equivalent amount of projects are under development,” said chief executive Pyotr Fradkov. The prospect of such business relations may whet the appetite, but it is the fate of Tajikistan’s hundreds of thousands of citizens working in Russia that is closest to Dushanbe’s heart. According to figures from the Main Directorate for Migration Affairs in Moscow, there were almost 900,000 Tajik citizens living in Russia in late 2016. If one accounts for workers living and working without proper papers, the real number is likely much higher. Tajiks comprise the second-largest contingent of labor migrants from Central Asia after much more populous Uzbekistan, which accounts for 2 million workers in the Russia’s economy. By some estimates, Tajik migrant laborers send roughly $4 billion home every year — a sum equivalent to around half the country’s annual gross domestic product. Two developments have threatened that economic lifeline in recent years. One is the knock-on effect of low oil prices on Russia’s economy, whose poor performance has, in turn, depressed job prospects for Tajik expatriates. There is little anybody in the Kremlin can do about that. Another more readily addressable matter is the bureaucratic hurdles thrown in the way of prospective migrants. Rahmon said last week the two countries plan to sign agreements to strengthen social and legal protections for Tajik labor migrants in Russia. One document to emerge from the inter-governmental economic commission session envisioned the creation of “specialized adaptation centers” for Tajik migrants in Russia. Russian news website Life.ru has reported that under one provision in the agreement under discussion, once an employer in Russia unilaterally tears up a work contract with a Tajik citizen, the fired employee will be required to leave the country within 15 days. Tajikistan is reportedly hoping to secure pledges from Moscow to allow its citizens to remain in Russia and seek new employment even after they lose their job. Those objecting to Dushanbe’s position claim that to allow an open-ended stay would open the way to masses of Tajik citizens living in Russia illegally. But Gavkhar Jurayeva, a migrant rights advocate, argued that the provision being sought by Tajikistan would provide workers with basic rights. Rahmon is also holding out for more assistance from Russia in the educational sector. Tajikistan would like to see Moscow raise admittance quotas for young people aspiring to enroll in Russian universities. The elephant in the room in all these matters is Tajikistan’s heretofore cool stance toward the Russian-led Eurasian Union. The bloc currently counts Armenia, Belarus, Kazakhstan and Kyrgyzstan among its members. Tajikistan is for now sticking fast to its wait-and-see policy. By all accounts, the achievements of the Eurasian Union have been underwhelming thus far. Even so, support for joining the bloc remains high in Tajikistan, according to polls conducted by the Eurasian Development Bank. Data from the bank published in October showed 68 percent of people quizzed in Tajikistan favored membership — down, notably, from 72 percent in 2015. When Putin arrives in Dushanbe later this year, it may be just to sign off on some relatively trivial trade and cultural agreements. Or it may be the latest step in Moscow’s ambition to definitively cement another nation within in its sphere of economic and political influence.